The Evil Eye, believed by many cultures, is an ill-wishing look of envy or dislike that causes bad luck or injury to the person at whom it is directed. Many cultures have amulets or talismans as protective measures against it. Think Rabbit's Foot. 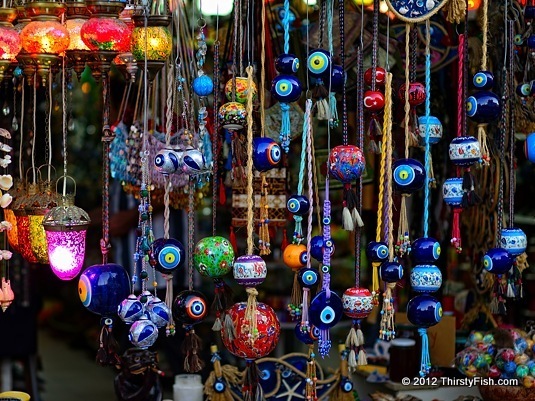 You can find Evil Eye Amulets in just about every handcraft and souvenier shop in Turkey. Given that Turkey is predominantly a Muslim country, this is somewhat odd. The origins of evil eye amulets can be traced to a Central Asian religion known as Tengrism. Tengrism is characterized by features of shamanism, animism, totemism, monotheism, polytheism and ancestor worship. In Tengrism the meaning of life is viewed as living in harmony with the world. In this ancient religion of the Turks, Mongols, Huns, Hungarians and Bulgars, it is believed that the world is ruled by the holy spirit of the Sky, and the fertile Mother-Earth spirit is there to provide for and protect all humans, so long as they live upright, balanced and respectful lives.